Personal and professional eye care that grows with your family and community. For all the milestones in life, we'll see you there. Contact lenses are a discreet way of managing vision impairments without being tied to a pair of glasses. Many optometric patients choose contacts over eyeglasses because they are convenient, comfortable, and capable of correcting vision without affecting appearance – it will also make it easier to wear non-prescription sunglasses. There are two main classifications of contacts – soft and gas permeable. Soft lenses are the most popular and are commonly used to treat people with age-related vision loss, astigmatism, nearsightedness, or farsightedness. They form to the shape of the cornea and tend to stay in place for the duration of wear. They are usually daily, biweekly, or monthly disposables. Gas permeable contact lenses, on the other hand, can also be used to treat most vision impairments, but are reserved for complicated fits or unhealthy corneas. Patients who are prescribed gas permeable lenses will benefit from the crisper and clearer vision but will have to adapt to the discomfort. Patients should also have a pair of glasses in their current prescription, to alternate with their contacts to ensure the best eye health. Glasses will be worn when you remove your contacts at night, on days off, after work, and on days when you are experiencing eye irritation or discomfort, giving your eyes a much needed break. The healthiest modality of contact lens wear is daily disposable soft lenses. If you wear a fresh pair every day, it decreases the risk of infections, dry eyes, contact lens overwear, corneal hypoxi (lack of oxygen) and many other contact lens-related complications. You may be a candidate for contact lenses if you require vision correction lenses and are looking for a non-surgical alternative to eyeglasses. To find out if contacts are right for you, schedule an appointment with your optometrist. What is the different type of contact lenses? 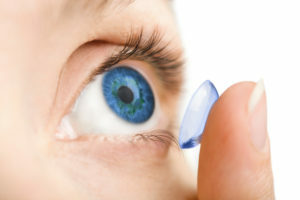 What should I expect when I am fitted for contact lenses? Your New Optix Optometry eye doctor will conduct a thorough eye exam and prescribe a contact lens brand and power based on the results of your eye exam and your frequency of wear. You’ll be fitted with a trial pair of lenses before you leave the office and asked to return for a follow-up visit several days or weeks later. How should I care for my eyes and contacts after my appointment? You will be given instructions designed to help you protect your new contacts, as well as your eyes. If you fail to follow these instructions, you risk getting a corneal infection that could threaten your sight. Most importantly, you’ll be instructed to wash your hands prior to handling your contacts. Depending on the type of lenses you wear, you will most likely need to remove your contacts at night before bed.